Nervous about negotiating your starting salary? Don’t be. According to CareerBuilder research, 73 percent of employers expect candidates to negotiate during the hiring process. What’s more, not negotiating can cost you as much $1 million over the course of your career. A few thousand dollars a year can really add up. If you stay at the same company for many years, your raise will likely be calculated as a percentage of your current earnings, which means that a lowball salary will follow you throughout your tenure with the organization. Every job offer is therefore an opportunity not just to boost your pay today, but to command a higher salary over the long-term. In a perfect world, every job listing would include a salary range, so that both parties could proceed without worrying about wasting their time on a low-paying job or a candidate that’s outside their budget. In this imperfect world, however, you don’t always find out how much a job pays until you’ve invested a fair amount of time in the process. As frustrating as this is, resist the urge to push for salary information at the first interview. If the hiring manager doesn’t mention range, don’t bring it up first. Make them fall in love with you first—while you secretly gather intel on what this job involves. You might discover that the role is more junior or senior than the title indicates, which will change your ask (and possibly your interest in the job). If you’re asked to name your price early on, it’s perfectly fine to say that you’re flexible and want to learn more about the job and the duties involved. People love to talk about their salary with friends and colleagues, and they should—being more transparent about pay can only help workers in the long run. Mystery around salary only benefits employers. That said, don’t assume that what you hear is the whole truth. Even if your cubicle neighbor is scrupulously honest while reporting his pay, you won’t know the full context. He might have a hot skill that you currently lack, or several years of experience in a related field that makes him more valuable to the team. To compare apples to apples, you need to look at vetted salary data from thousands of anonymous respondents who have no reason to stretch the truth. That’s where online salary calculators and surveys come in handy. Use these to compare your salary to that of peers with similar skills and experience. Take the time to research what is a good salary for someone with your career credentials. Earlier, we said that employers shouldn’t base offers on candidates’ previous salary. Why? Because companies should use their compensation budgets to incentivize and reward the things they need in order to achieve their business goals. For one company, that might mean paying a premium for a certain skill-set. For another company, it might mean rewarding institutional knowledge and client relationships. Basing salary offers on what some other company has decided to reward is ineffective, to say the least. But barring a federal law banning salary history questions during the interview process, there will probably always be some employers who choose to go this route anyway. As a job seeker, your goal isn’t to make them see the error of their ways. Your goal is to get paid. To do that, try to steer the conversation away from salary history and back to the subject at hand: appropriate compensation for this particular job. Keeping Salary History to Yourself Can Backfire. 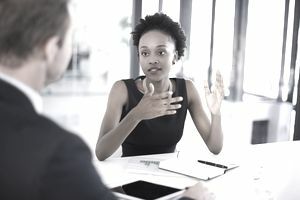 PayScale’s report, Is Asking for Salary History … History?, revealed a surprising fact about job seekers who withhold or reveal information about past pay. While men receive higher offers when they refuse to disclose their salary history, women actually suffer a pay penalty for doing the same. That means that when it comes to salary history, men and women may need to use different tactics in order to get the highest offer. One answer may be to tie the higher request to a communal benefit. For example, a woman negotiating a job offer for a sales role might point out that it wouldn’t be in the company’s best interests to hire a seller who took the first offer on the table. Finally, don’t forget benefits like health insurance, 401k match, and stock options. The number you see on your paycheck is just part of your total compensation. Excellent health insurance or stock options that are going places might add more to your bottom line than a higher salary. Look at the big picture, before you accept or reject their final offer.